Music streaming service Guvera has surpassed a 10 million user milestone worldwide. It’s attracted over 3 million users in India alone since launching in the territory in November last year. Guvera’s aggressive global expansion has seen it grow from a user base of 1.5 million users in October 2014 to 10 million users in April 2015. It says that approximately 35,000 users have joined the service each day, across the world, over the past 22 weeks. In January, Guvera acquired the UK’s Blinkbox Music platform in a deal understood to be worth around £4m. Blinkbox brought with it 2.5 million registered users. “As a young brand, we welcome the 10 millionth user to the Guvera platform with a real sense of pride and delight,” said Darren Herft, CEO, Guvera Limited. “We’re thrilled to see Guvera’s global community growing daily and we hope to bring more music lovers on board as we enter new markets in 2015. We believe our growth is also testament to the success of our unique non-disruptive ad-funded model, which allows our users to discover and play the best expert curated music’’. Australia-born Guvera offers both an ad-funded (Guvera Play) and premium (Guvera Platinum) tier in most of the 20 territories in which it operates – which include Australia, the US, Russia, India and Malaysia. It claims to offer a sophisticated ad platform that matches brands with audiences via ‘contextual advertising’ – just like you’d find on TV and commercial radio. Herft explains, “Branded channels are a great example of how users are able to engage with brands in a less disruptive manner. Guvera is putting the consumer in charge of the advertising experience. Moreover, advertisers know that they are paying for ads that consumers want. Guvera’s aggressive growth in India has helped the company rack up some useful user consumption data in the market. 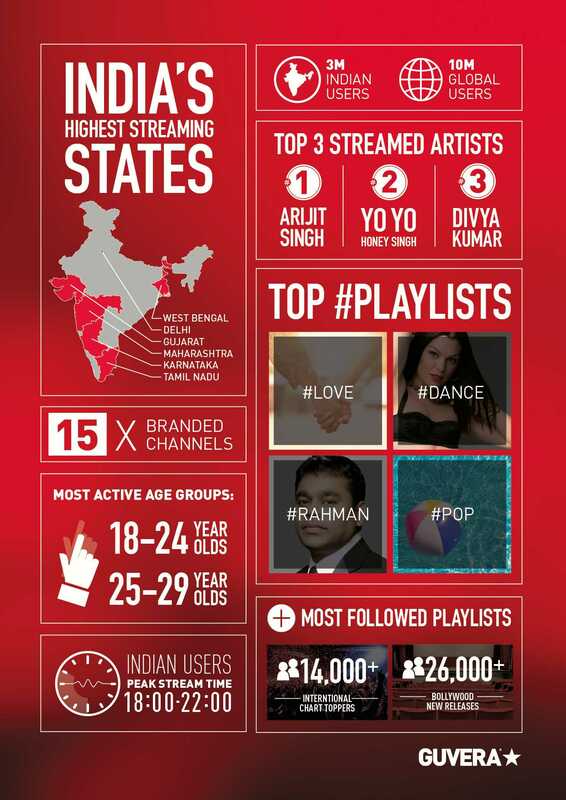 The research points out that amongst the Indian user landscape, the states of West Bengal, Delhi, Gujarat, Maharashtra, Karnataka, and Tamil Nadu are India’s top music streaming states. You can see more in the handy inforgraphic below. Guvera has signed a global partnership with PC and tablet company Lenovo, which will see the Guvera app pre loaded onto Lenovo smartphones and tablets across a potential 160 markets. Earlier this month, Guvera debuted its newest innovation Fradio at SXSW. Currently available in the USA and Australia, with plans to further expand in 2015, via iOS and Android, Fradio allows users to host their own radio broadcasts using the millions of tracks on the Guvera music library. Friends and fans can then listen to and interact with the broadcast in real time, through live talk-back, comments and track requests.